Now, in a completely revised and updated edition, Dr. Singer incorporates the latest developments in Jungian psychology (and there have been many since 1972), particularly in the areas of masculine/feminine relationships, the use of psychotherapeutic drugs, and the evolution of Jung’s concepts and personality types and its application both clinically and in the world of business and industry. “The clearest and most coherent exposition of Jung’s total thought that I have ever encountered,” said Robertson Davies. Throughout his life, Jung continued to evolve his theories, unceasingly attempting to integrate his new insights into the body of his work. My favorite of all the sayings ascribed to Jung is, “I thank God I am Jung and not a Jungian!” By this I understand that he did not want his followers to accept blindly what he wrote as “truth” but to do as he did—be themselves and adapt their insights to evolving situations. So now, a quarter of a century after Jung’s death, I feel justified in taking a fresh view of Jung’s concepts and considering where they remain applicable to contemporary life and where some revisions may be called for. For what is psyche, if not soul? Soul is what makes us more than a pile of chemicals and a tangle of neurons; soul is that essence of consciousness that enables us to know ourselves and our world, to recognize what is unique in us as individuals and what each one of us shares with the immense totality of which we are a part. After thirteen printings and with nearly 100,000 copies in print since its publication twenty years ago, Boundaries Of The Soul has become recognized as THE classic introduction to Jung and the practice of Jung's psychology.The book has been described as "the clearest and most coherent exposition of Jung's total thought," by Robertson Davies, and Alan Watts has called Dr. Singer "one of the great masters of the art." 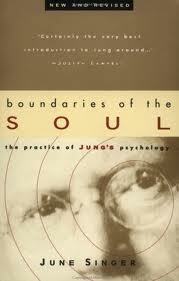 Now, in a completely revised edition of Boundaries Of The Soul, Dr. Singer incorporates the latest developments in Jungian psychology over the last two decades, particularlv in the areas of masculine/feminine relationships, the use of psychotherapeutic drugs, and the evolution of Jung's concept and personality types and its application both clinically and in the world of business and industry.In addition, the case histories, so central to understanding many of Jung's concepts, have been re-examined and revised where necessary to correspond to the spirit of today's world. The updated edition of Boundaries Of The Soul should reaffirm the book's long-standing reputation as the best introduction to Jung's thought available.